Soft silky and sumptuous this gorgeous organic cotton single fitted sheet from Natural Collection has a subtle stripe and lovely sheen making a truly special addition to our organic bedding range. Oxygen white - naturally whitened with no chlorine or optical brighteners. Please note: this bedding is naturally whitened and therefore is not a ‘true’ white. 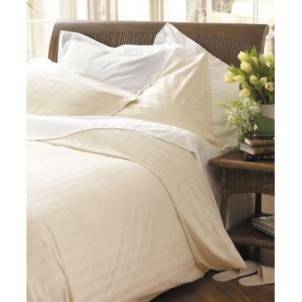 The Natural Collection Organic Cotton Single Fitted Sheet - White product ethics are indicated below. To learn more about these product ethics and to see related products, follow the links below. I was so pleased with my own king size sheets I got these in single for my 92yr old mum. She thinks they are pure heaven. Q: What is the thread count of these sheets please?